Have you ever traveled to a place and then wanted to go back? Somehow it spoke to you of comfort and you felt at home? Cuenca, Ecuador does this for me. I have been there before. Loved in then, love it now. 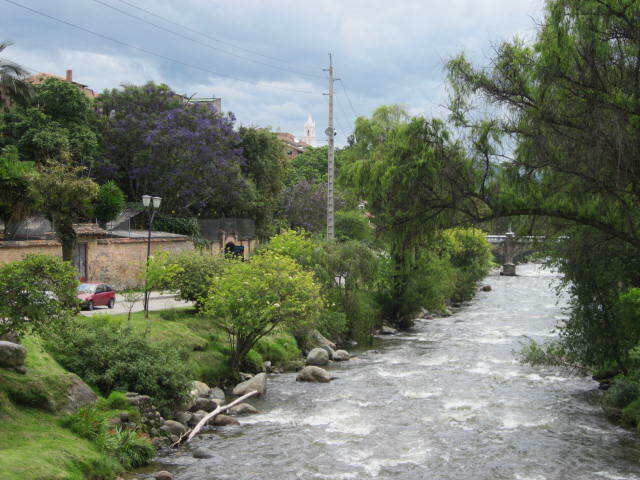 Cuenca (Santa Ana de los Quatros Rios de Cuenca is the official name) is beautiful, clean, charming, and welcoming. It is also livable, presuming you have life or travel experience in other countries and are easily adaptable. Over the past five years I’ve found Cuenca continuing to appear on polls and magazine lists as a top retirement destination worldwide. It attracts more residents from around the world than any other Ecuadorian city. 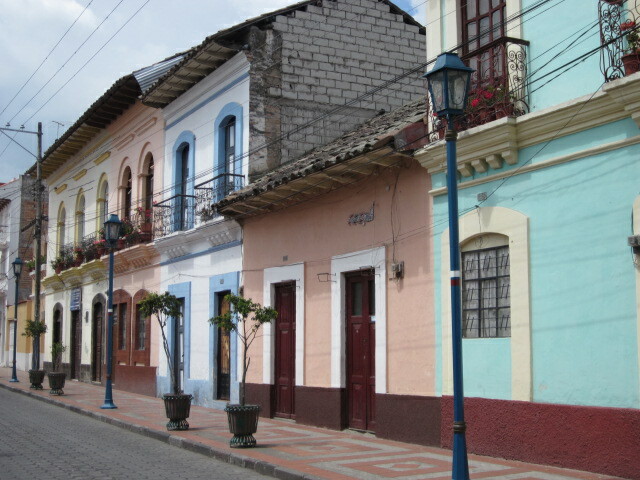 Well for one, Cuenca is a UNESCO Heritage Trust Site full of splendid colonial buildings and cultural events. Think happy visuals and pleasing experiences. Cuenca (which means “basin”) is nestled in a valley surrounded by the Andes with panoramas and vegetation that are fabulous eye candy – lavender flowering jacaranda trees swaying in the breeze, Tipu Tipuanas (aka the Pride of Bolivia) brimming with yellow flowers, pepper trees and weeping willows, roses of every variety and color – among the most perfect I’ve ever seen – including the gorgeous roses of France! The Tomebamba and three other rivers pass through the city with grassy knolls on both sides for miles, inviting you to lounge and fall asleep to the sounds of the water. Bridges and walk ways are mostly of old stone, and there are lovely homes, both old and new to admire. The skies are clear and crisp, the clouds ever changing in their shape, and the colors, especially at sunset, are amazing. For the most part, the air is uncommonly fresh if you come from a place like Los Angeles. Approximately 200,000 people of mostly Spanish, African, mestizo, and indigenous descent live there. The elevation is 8,200 feet. 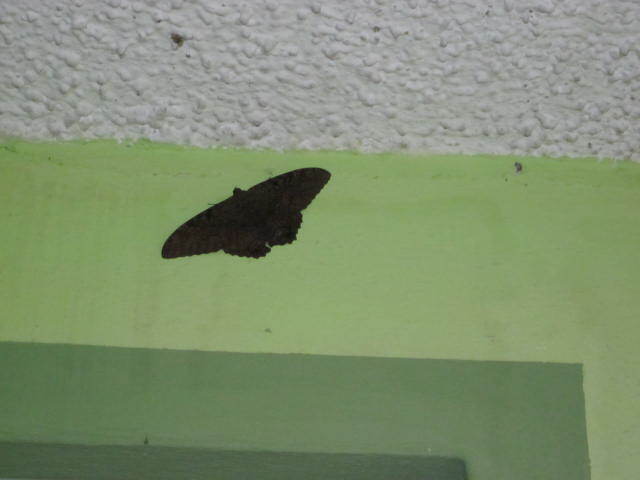 Insects and other creatures – rarely a mosquito and other pests at this altitude, but there might be a few ants as well as large moths almost 12” from wing to wing whom you can befriend. Medical care – outstanding, state-of-the-art hospitals (three) with top notch equipment; three universities with medical schools; physicians and dentists who have also studied in the U.S. and Europe; small herb, vitamin, and indigenous medicine shops; a school of naturopathy which is scheduled to open in spring 2012; medical costs about 1/5 what they are in North America; affordable private medical insurance; and a government health plan if you are over 65 and living in the country on a pensioner’s visa. 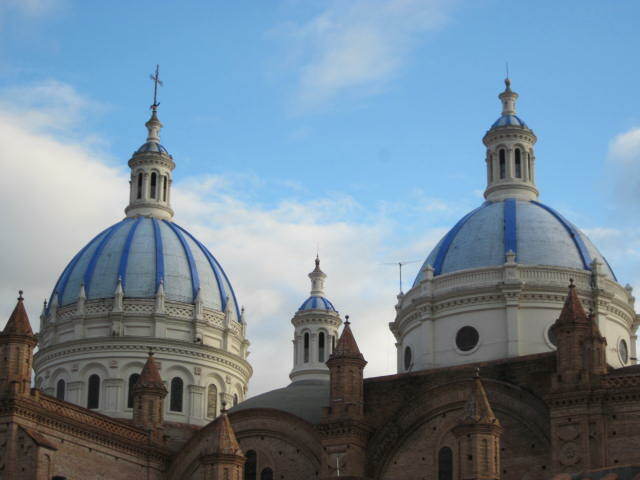 Cuenca is also considered a top medical tourism destination. Clothing, Furniture, Electrical items, and Toiletries – ouch!! No Bloomingdale’s, Macy’s, Nordstroms, Marshalls, TJ Maxx, or Steinmart… rare to find quality clothing (bring your own); not the best quality furniture but it will do and there are exceptions, just search; bring your own lap top (all computer equipment and appliances cost more than they do in North America); no organic cosmetics or hair color found recently but maybe someone will start an organic business soon?! Ecuadorian driving habits – if you are hit crossing a road on foot it will be your fault, be careful!! Ecuadorians who party, party late into the night with loud music that can be heard for blocks. This can be any night of the week. Unless you are a night person and wish to hear fabulous cumbia melodies vibrating in your head, you might choose the “Gringolandia” area for living if you prefer to retire early and wish an atmosphere of peace and quiet. 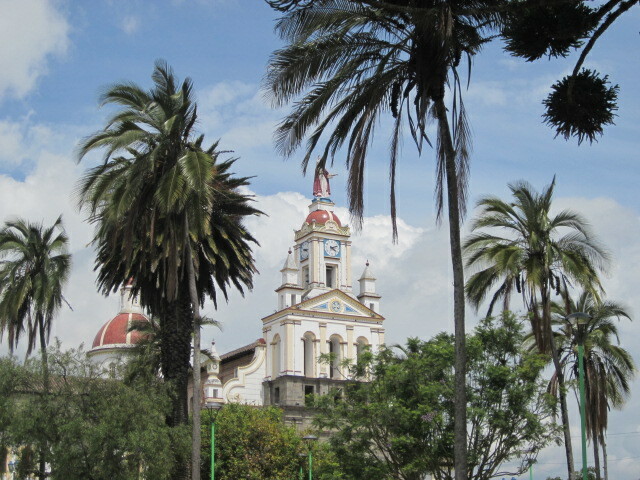 Weather – I have heard that some Americans have contracted pneumonia and had to be hospitalized so it is advised that you research the climate and assess whether or not it is compatible with your health needs; also related, please note that some people are sensitive to Cuenca’s bouncing weather patterns from 70 in the afternoon to 40 at night. June, July, and August are known for heavy rain every day. Please keep in mind that Ecuador is still a developing country, and that no place on the planet is perfect any longer. Despite some of the sacrifices mentioned, I remain an ardent Cuenca fan. I’d love to live in a quiet apartment with a view to the Tomebamba!! For more information I highly recommend Cuenca resident Connie Pombo’s book Living and Retiring in Ecuador, full of very useful tips, and available on amazon.com. I also like Sofia Hoffmann’s www.captivatingcuenca.com site (she’s a Cuencan married to an American), the www.ecuadorexplorer.com website which offers practical information for Cuenca and the rest of the country, ditto for Charles Barrett’s www.expatexchange.com, noteworthy for its visa information, and, www.retire-in-ecuador.com. For whimsy and fabulous photographs click on Deke and Shirley’s www.accessecuador.com. See www.cuencahighlife.com for an idea of what is happening at the moment in Cuenca. I wish I had known about the Gringo Tree newsletter list before my recent trip. You can subscribe on the web site. 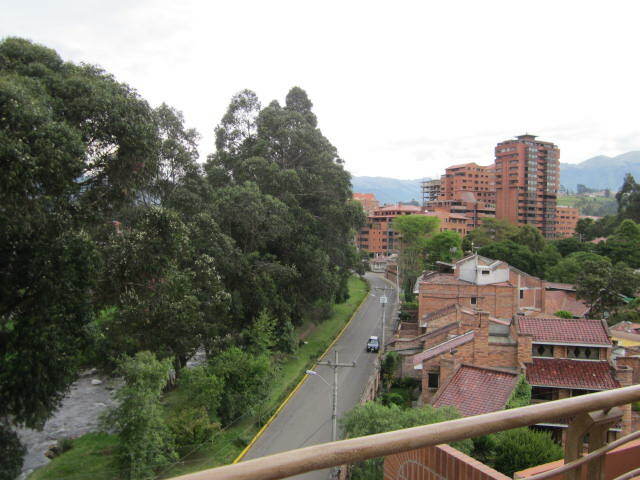 There’s a Cotacachi, Ecuador based blogger, Gary A. Scott, a business man who focuses primarily on real estate; he seems to provide worthy insights at www.ecuadorliving.com. There are several other ex-pat blogs to discover and learn from; I have yet to discover them but plan to. If you are curious about discovering Cuenca, I trust this blog has helped a little. 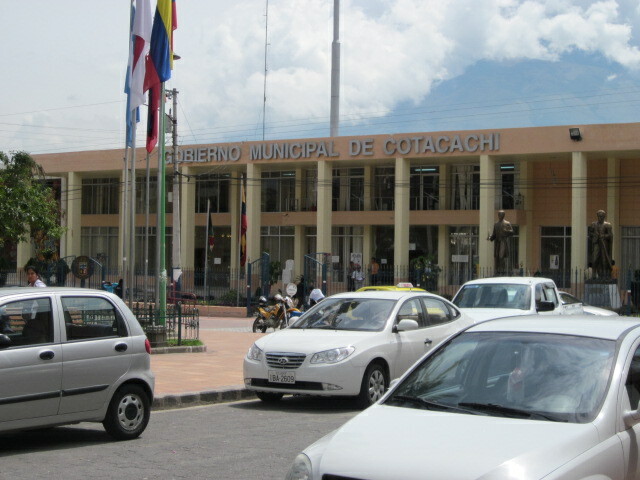 If you are curious about Cotacachi, there is a December entry further down on this site. Welcome to the New Year 2012 (of the western calendar)!! How fortunate we are to have survived another chaotic year on our planet. I’m not that hungry today (thank goodness! ), so I ordered something simple. And I am breaking the food combining basics of waiting one-half hour that I try to follow because everything here is eye candy and so tasty!!! I never feel guilty with their organic wonders. 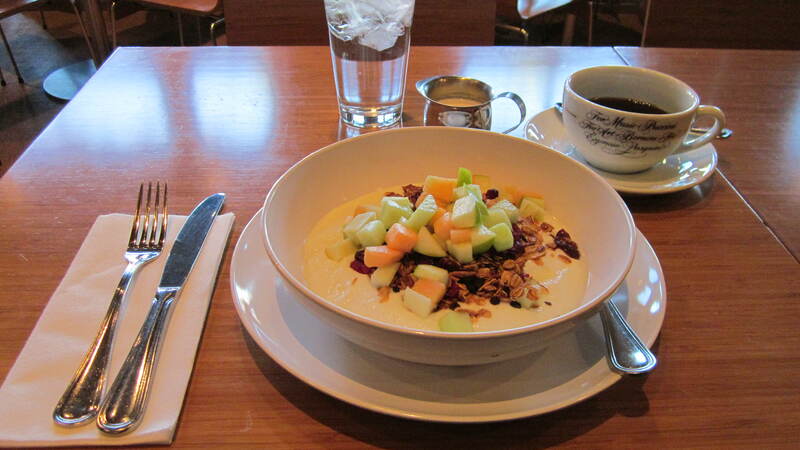 To the left is a photo of Luca’s homemade granola with fresh fruit and homemade yoghurt. The coffee you see is yes, organic (another special treat, I usually drink green tea) but today is a special day. And the Italian latte cup is inscribed “for music Puccini, for art Bernini, and for espresso Pasquini”!! Luca is owned by a northern Italian and his American wife Rebecca. Everything served here is made with love, and the Italian entrees are authentically Italian as opposed to Italian-American. You can read the menu and see some photos at http://www.lucaonsunset.com . I like coming here not only because it is dependable but also because I believe in supporting local businesses that do everything they can to be green, environmentally conscious, and health conscious. I also like that this morning I am surrounded by two lovely Ethiopian ladies, a handsome family from East India, a variety of Asians, and various Americans of other backgrounds. Today I hear gentle music from the Middle East. Delightful! Some people say grow where you are planted. Please know that despite my nomadic tendencies and passion for living in other countries, I still love LA!! I believe it is named City of the Angels for a reason, despite its reputation for glitz and the superficial. Believe it or not, LA, as many other places, can be a marvelous place for inner travel; it offers a plethora of Buddhist, Self-Realization, and Vedic temples, gardens, a great variety of yoga homes and churches, lakes and an ocean, and, need I add, my own little sanctuary in West Hollywood surrounded by trees, green, and the energy of light. This year I hope to introduce you to more adventures in America and abroad, and to some of the heroes and heroines I meet along the way, such as Luca and Rebecca of today, all doing their part to make our lives more pleasant. I am open to all the wonders that await me and I send each of you my wishes for a 2012 filled with laughter, happy opportunities, health, prosperity, peace, and traveling if you so desire. One of the next best things to taking that walk is watching The Way-The Movie about that journey. For me it was a blessing to see this soul-searching film just in time for Christmas! Do not wish to spoil the pilgrimage for you so I’ll refrain from mentioning the story line, but thought I’d introduce you to the four main characters – a sweet Dutchman, a tough cookie Canadian gal, a charming Irish writer, and Martin Sheen as the American ophthalmologist who has just lost his son. None of them have met each other before; they meet on the road, just as the universe intended. The film is lovingly produced, directed, and written by Martin’s real-life son Emilio Estevez, who also appears in magic realism moments. Special notes: part of the movie is filmed in Galicia which is the land of the Sheen-Estevez ancestry. And Taylor, Martin’s grandson and Emilio’s son, is married to a young woman Taylor met on his first trip to Burgos with Martin. After watching the movie you might be compelled to run out and buy Spanish sheep’s cheese, some rustic bread, and a Jerez sherry, or, if more inclined, you might be compelled to make this trip of a lifetime, or another trip you’ve always had in mind. Below the photo you’ll find a review of my favorite book on the subject of this journey which was written for Amazon.com. For all you Lasse Hallstrom fans (me), lovers of south Yemen (one of my all time favorite destinations), fly-fishing afficionados (some day), and multi-cultural stories (me), this movie will be a must see!! 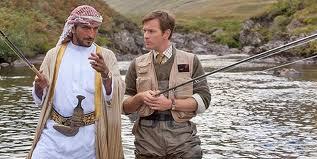 Imagine, an Arab who hires a Scotsman to bring fly-fishing to the high desert. Fun!! Release date is set for March 2012. Yalla!! You want to visit Ecuador. Yes do that, for the most part you will be warmly welcomed! 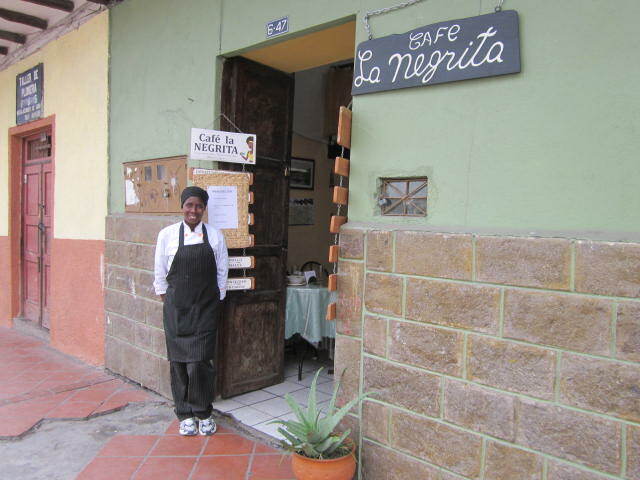 There is much to see and experience – historical sites, eco destinations, extraordinary vistas of the Andes and volcanoes, delicious fruits and vegetables, and most of all the gentle people of every origin – black, indigenous, European, mestizo. 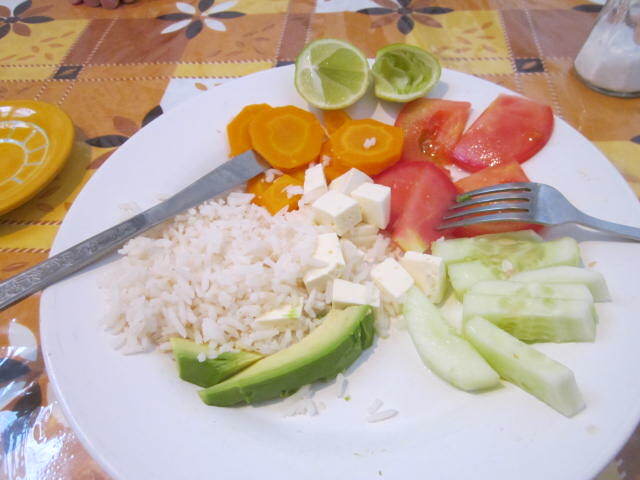 But do prepare to experience a lower standard of living if you have not yet traveled in this part of South America. Earnest Ecuadoreans are doing their best to improve quality, and, prices are considerably less than in the U.S. so it offers terrific budget traveler value. If it’s your first trip to Ecuador I suggest you start in the north by flying into Quito, travel around the north, and then head south to fly out of Guayaquil (closest to the Galapagos Islands), or vice-versa. 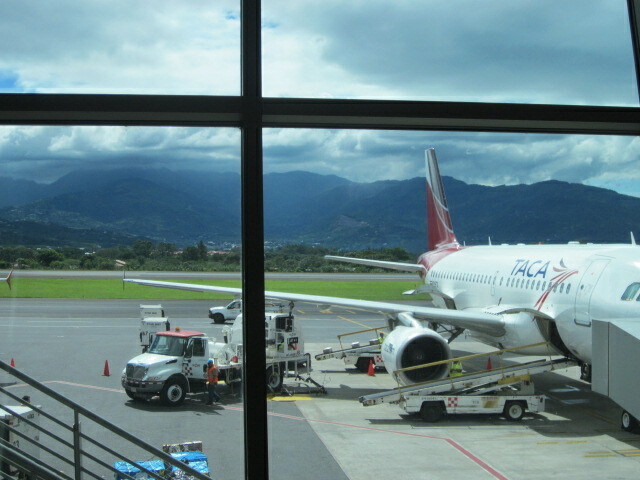 To reach Quito, the capital, which is a UNESCO Heritage Site, taking the plane is a fine option. American Airlines works if you are collecting or using mileage ; there’s a day trip via Miami. I did that once but found the Miami Airport challenging because of its long distances between terminals and international and domestic flights; I almost lost my flight. As I am writing this I have just read that American Airlines has filed for bankruptcy. Ouch!!! There goes that option. Continental, Delta, and Mexicana also fly to Ecuador. My preferred route seems more direct if traveling from the West Coast. I like the overnight TACA/LASCA flight from LAX via Guatemala and Costa Rica, (you stay on the same plane so it is relatively painless); or LAN through Lima where you have to change planes. The LAN choice is less inviting if you have to overnight in noisy Lima. Wouldn’t you rather be stranded in lush Costa Rica? Also, TACA prices are a little bit less than LAN prices as of this post. Other than flying, which offers speed, great panoramas, and generally fewer challenges, you could bike down (as many adventurous Canadians and Americans do), drive down on the Pan-American Highway, take mostly country buses, or, go by ship – days to manifest. Wish there were a rail system through Central and South America the way there is in Europe. 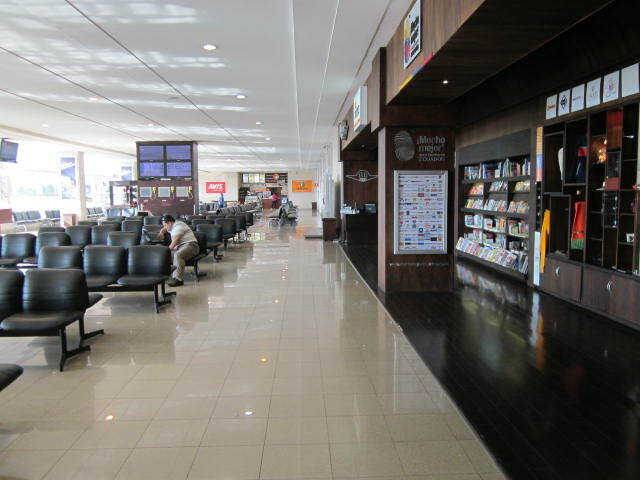 Once you arrive in Quito (a small airport by North American and European standards) and pass through customs, you will see three booths on the right side as soon as you exit that offer taxi transportation. The price will be between $12 and $20 with a certified taxi (bargain if you can), often a van, direct to your destination in Quito. You can take taxis on the edge of the airport for $3-$5, but it is not recommended unless they are yellow and have orange plates. In case you hadn’t heard, Ecuador, like some of its neighboring countries, is notorious for petty theft, so you must be vigilant at all times. Best to keep your passport, credit cards, and cash in bra stashes and interior holsters with small amounts in your pockets. Please watch your bags and your camera. Best not to wear expensive jewelry either. The currency in Ecuador is the U.S. dollar. Taxis in most cities are $1 to $2 for a trip, $3-$5 for longer city trips, depending on the time and distance. I like to agree ahead of time on the amount, less stress. Local buses are 25 cents. If the ride is about ½ hour or more, expect to pay 50 cents. Long distance buses are generally a step above local buses in comfort and cleanliness but they cannot compare to a Mercedes Benz first class bus in Mexico, for example, or to buses in western Europe. 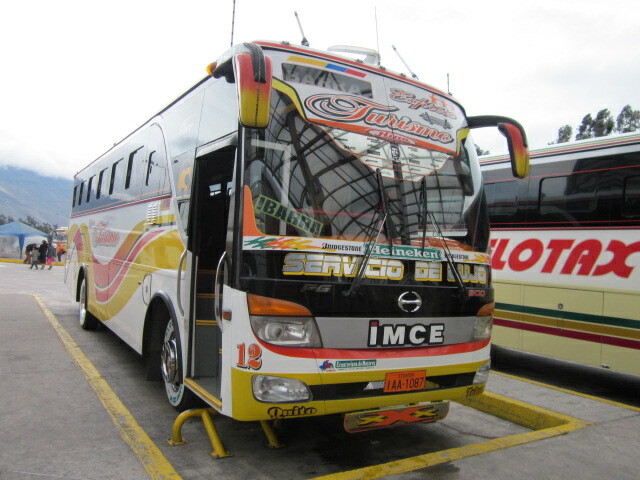 Tourist buses are the exception in Ecuador, you can expect a modicum of quality with them. Flota Imbabura runs an overnight bus which starts in Ibarra, with stops in Otavalo and Quito, and then goes all the way to Cuenca for $14. It also travels from south to north. 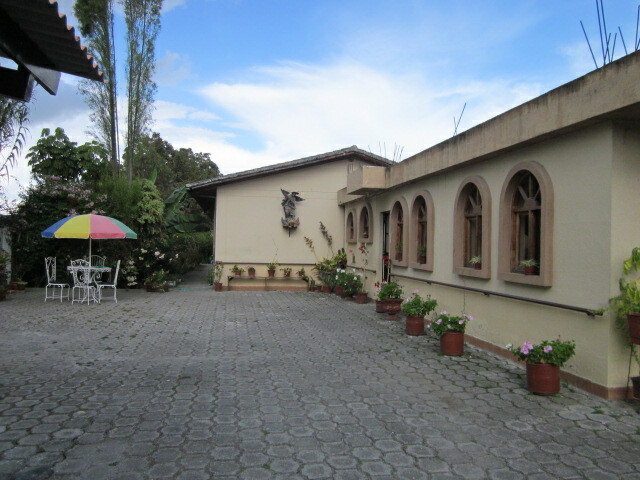 The time between Otavalo and Cuenca is 12 hours. If you are traveling alone, buy two seats and put your luggage next to you, not underneath the bus. And do not put anything underneath your bus seat. On occasion, travelers have lost belongings and funds. These buses have one driver and a ticket taker/luggage valet; there are bathroom facilities on board (not recommended). These direct buses are not supposed to pick up passengers along the road, but they do. Pack your own snacks and water. There are other long distance bus companies to choose from as well but this is the only one I have experience with. The best option for ground transportation, if you can afford it, is to hire a driver. There are several reputable tour companies that can arrange this service for you. Take a certified taxi to the north bus station, the Carcelen. Travel directly to Otavalo which is about 2 hours north. 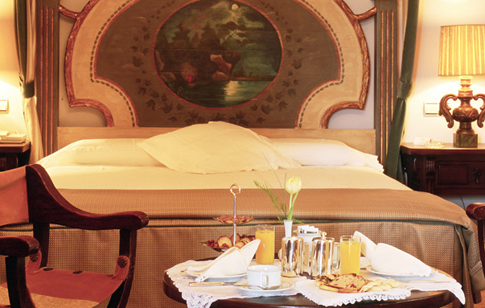 Take a taxi from the bus station to your hotel. ($1). Spend two nights in Otavalo with side trips to Cotacachi, Ibarra, and the fabulous mountain and volcano sites around Otavalo. Otavalo is famous for its indigenous marketplace full of handmade leather and wool goods, and, folkloric art. Take the bus to Quito and spend two or three days that include a quick trip to the Middle of the World, the equator, if it is of interest. From Quito drive or fly to Cuenca. It’s a long trip by car but worth it during the day with a private driver; you’ll see a part of Ecuador with vistas that may remind you of Switzerland except for the occasional cactus. 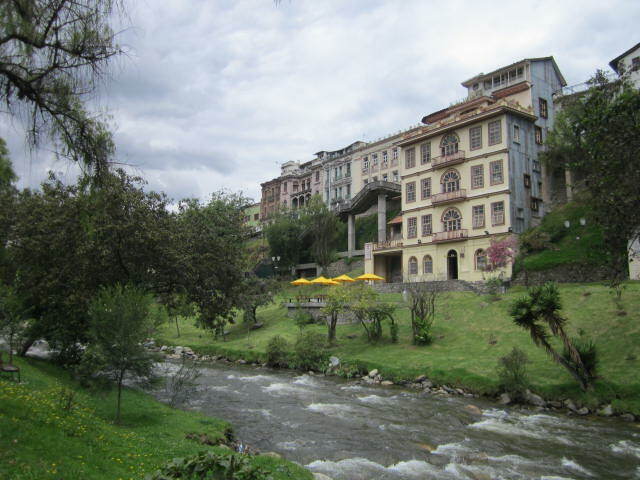 Spend two-three-four days in charming Cuenca, another UNESCO Heritage Site with many architectural wonders (you’ll see why so many North Americans have moved here); try to include a side trip to Banos to the thermal baths, to see waterfalls, and other wonders of nature. From Cuenca make your way to Loya and Vilcabamba to what is termed the Land of Eternal Spring with the best weather in all of Ecuador. Then make your way to Guayaquil for a quick visit (it’s a port and commercial center known for its night life – not my favorite place but I do like that there are iguanas in the city parks), and then on to the Galapagos for more incredible experiences with nature and finally, relaxation. Additional note about Guayaquil: the U.S. State Department has put out warnings to not hail taxis in Guayaquil as there have been taxi kidnapings recently. For all you beach lovers, the cities of choice for most travelers are Manta and Salinas. Most of all, have fun! 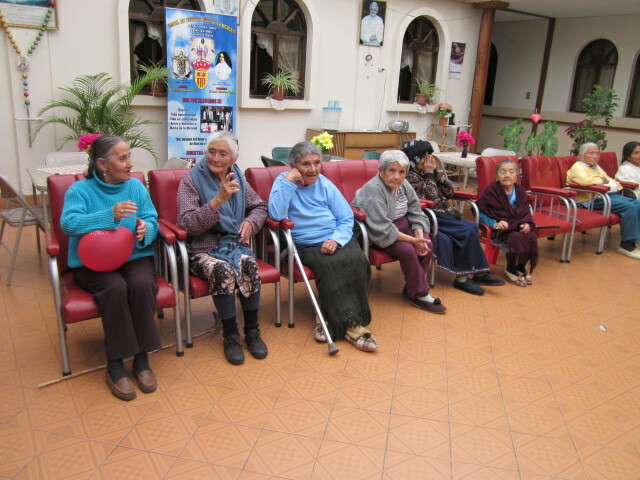 Ecuadorians are, generally speaking, kind-hearted and they wish you well. 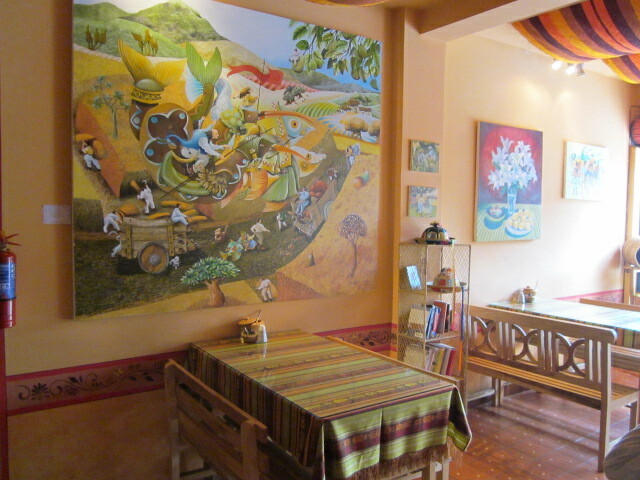 I begin this blog on the special day of 11/11/11 from the “pueblo magico” of Jerez, Mexico. The government has deemed this old city in the colonial highlands of Zacatecas state as “magical.” (It was built by Spaniards in the 1500’s and is currently under restoration for present and future tourism). I write from the dining room of Hotel Jardin where I am enjoying the laughter from the very good-looking jerezanos who are celebrating a wedding. Without the cowboy hats these men look very Spanish though I imagine they would say they are proudly Mexican. The women are beautiful – elegant and glamorous in pearls. Romantic Mexican songs play in the background. I am smiling as I look out the “French” windows to the trees and flower garden of the park across the way. Great to feel transported; it’s a moment of heaven. Because of “bouncing electricity” (possible surges) this missive is brief. I have every intention of posting mini-diaries + photos and more within a few days. May the road ahead take each of us to wonderful places.